I am only going to give this film a lukewarm recommendation, however there is a few redeeming qualities that allowed me to enjoy this deliberately plotted film. First of all, I was a little worried that a film about 9/11 might have underlying political undertones. To my surprise, like the very good United 93 by Paul Greengrass, Stephen Daldry steered as far as possible from the event and focused more on the people and how they deal with their loss. As I mention above, the pace of this story is quite slow and deliberate, as if to not leave any important detail out of the boy's journey. 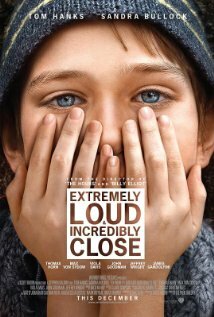 The boy played by first timer Thomas Horn is the true revelation from this film. His portrayal of Oskar Schell is very brave and unique. I have always admired children actors and when they do it right, it can blow you away and carry an otherwise ordinary picture. Although never fully explained, his character is a unique savant/genius whose compulsions and drive are uncompromising. This character drags us through his thought process and as a gift allows us to see the evolving post 9/11 world through a different set of eyes. Although he has the ability to show compassion (as he does to his struggling mother) his deductive observations of people and the world around him are quite vulcan-like. A perspective I have always enjoyed. He does not seem to be angry at the terrorists, nor is he defeated by the dejection of his loss. He almost accepts these as part of his new world and instead of succumbing he defiantly sets out searching for a way to retain or recover any part of his previous life no matter how small. He is smart enough to realize that he will one day cease to remember what his father looked liked and how he made him feel, so he decides to continue on the mental exercise that his father left for him on the day that he disappeared. I think only an intelligent boy could play this part and Thomas Horn is such a boy. See here how he confidently controlled the board on Jeopardy. This real life video is how young Thomas got his start acting. Further only such as boy can have the maturity to navigate this evil world that men have created and literally piece together in a form of a puzzle. His only struggle that he has a hard time resolving by himself is 'why would someone who did not even know my dad want to kill him'. A great question, that know one can answer, nor does the film try. He does at the same time understand that he is not the only child facing loss and unlike most (including adults for that matter) he can not only sympathize with this but is also willing to concede to it. You will have to watch and discover this for yourself. Now there is one other thing that I would like to point out about this movie. As I watched it I could not help but draw similarities between it and one of my all time favourite movies Empire of the the Sun. Spielberg's classic is a superior movie in every way, however both offer a few similarities. Both give us a relatively unknown young actor that deliver performances like we have never seen before. Both characters face loss, are driven and share the distinction of having been thrust into premature adulthood given their untimely circumstance and surroundings. Both prove to have demonstrated unique ways of being a survivor. And I am also hoping that both produce huge box office stars. Undeniably Christian Bale is an incredible and unique actor. From the moment that I saw him in Empire of the Sun I knew I was looking at a future star. Although he had done a list of minor characters after Empire it wasn't until I was being mesmerized by the his lead role in American Psycho that I searched back to make sure that he was in fact the little boy from Empire of the Sun. I had a similar experience when I rediscovered Philip Seymour Hoffman in Boogie Nights, from the first time he stood out to me in Scent of a Woman. You see some spark from a young performer like that and you only hope to see it again some day. Perhaps Thomas Horn will not show the depth to repeat his performance but here's hoping. One other similarity is the unwilling mentor characters of John Malkovich and Max Von Sydow both brilliant roles in equally stunning careers.